Property 9: Macnicol Cottage / Pet Friendly / Wheelchair access. Property 11: Songbird. Federal Byron Hinterland . Perfect place to recharge ! Goonengerry Cottage - beautiful rural and coastal views. Property 25: Goonengerry Cottage - beautiful rural and coastal views. 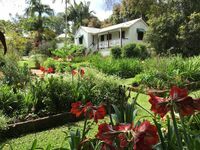 Property 29: The Cottage with lush green rural views from $95 a night.